Scary times for little cats. We’re headed into another summer thunderstorm season in central Florida. 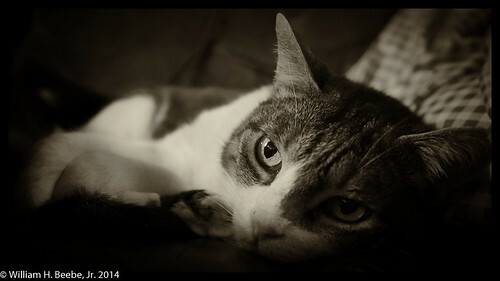 When the skies rumble loud and low enough to feel it in the house, the animals hunker down. Lucy was heads up looking around until the thunderclap arrived, and then she wiggled down into the cushions on my deep leather chair, wrapping her tail up under her chin. It’s coming up on six years since she walked in through our front door. But I don’t think she’ll ever forget being turned out by her former owner to fend for herself. I don’t think it’s anthropomorphism on my part to express this for her. There are three absolutes in this world: death, taxes, and the complete and total lack of journalistic integrity with grocery store tabloids. 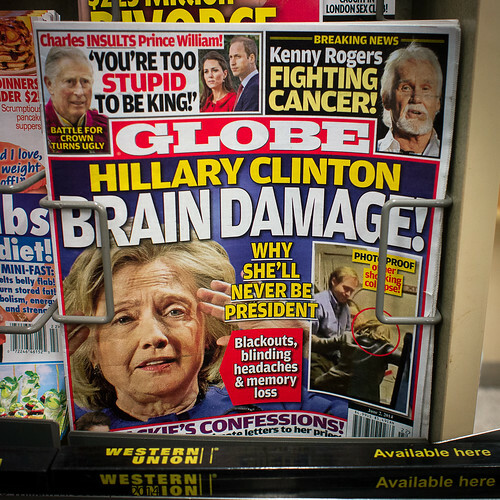 Case in point is this hatchet job published [sic] by the Globe out of Boca Raton, Florida, which I just happened to see tonight at a local Publix grocery store checkout. This is the same lie first puked out by Carl Rove in early May and reported by that bastion of northern journalistic integrity the N.Y. Post. This was Carl Rove and the Republican establishment attempting to keep alive the Benghazi lies and misinformation by any means possible. The key event is then Secretary of State Clinton’s admission to a hospital for three days for health reasons right in the middle of the initial Republican Benghazi witch hunt. The Republicans took this as a personal affront, and Karl Rove hit upon the brilliant, if twisted, lie of accusing Ms. Clinton of brain damage and a 30 day stay in the hospital. This is the start of the 2016 presidential silly season (even if it is 2014). This is the Republican’s efforts by any means possible to discredit through lies, like they tried with Obama’s birth certificate and the resulting birther controversy. This is also Rove’s attempt to get back into the good graces of the right after his meltdown during the 2012 election reporting of Ohio presidential results, where he tried to keep Fox News of all people from calling Ohio for Obama. Who’s acting like they’re suffering from brain damage? What makes this sickening for me personally: I have no desire to try and support either Obama or Clinton. But the behavior of Rove and Co. makes them the worst of the two sides. I won’t put up with lies from anyone, and in Rove’s particular case, his means never justify any of his ends.